Coupar visited this year's San Francisco Fall Art & Antiques Show celebrating Celestial Imagery in Art, Antiques & Design. 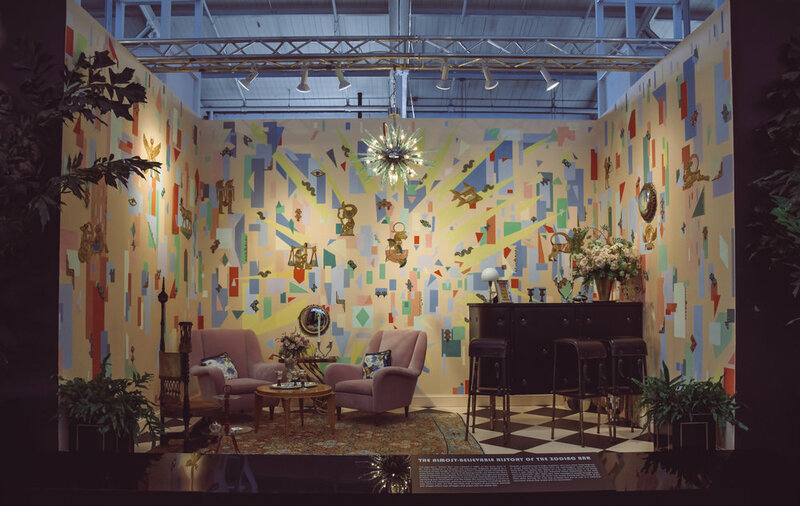 Held at the Festival Pavilion in Fort Mason Center this October the show featured approximately 60 dealers from across North America and Europe, offering an extraordinary range of fine and decorative arts from around the world. At the Grand Entry Hall, four Designer Vignettes set the tone of the show. In collaboration with de Gournay created otherworldly wallcoverings for Ken Fulk, Charlotte Moss, Madeline Stuart, and The Wiseman Group. New York designer and author Charlotte Moss took her inspiration for The Sun from the drawings of Antonio Basoli (1774-1848) set designer, decorator, and painter from Bologna. "The artists at de Gournay embraced the atmosphere I envisioned," she said. Exploring the dark side of The Moon, Los Angeles based Madeline Stuart, took her cue from Japanese artist Matazo Kayama. Against the moonlit backdrop, Stuart showcased exquisite furnishings and objects from China, Korea, and Japan. In The Stars vignette, The Wiseman Group collaborated with de Gournay to reimagine surrealist work by American artist and filmmaker Joseph Cornell. To anchor the space, they created an astrolabe plate painted floor painted by Stancil Studios. Like ephemeral stardust, the show is over, and the beautiful vignettes dismantled. Coupar looks forward to next year's San Francisco Fall Art & Antiques Show and seeing the magic created in the Grand Entry Hall.